Hopefully by now you will have seen our Dundas take on the 12 Days of Christmas. We wanted to give you a peek at how the video came together. 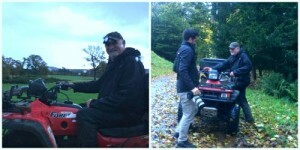 The day started bright and early at 7.15am with Rachel, our marketing assistant, and Luke and Simon from The Edinburgh Film Company, heading out onto the estate in the search for pheasants. Andy the Gamekeeper helped us find the pheasant ‘hang outs’ so that we could try and get some on film. There are thousands of pheasants on the estate but they are very good at hiding. Eventually, after an hour of running around and trips on Andy’s quad bike, we managed to capture some footage! 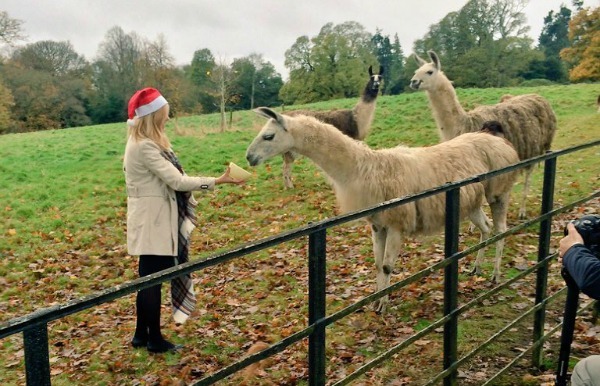 Next to film were the llamas – we definitely ignored that well known rule of never working with animals*… Simon was keen to get right in amongst them and hopped over into the field armed with an apple. He had a chat with one and it turns out llamas are very relaxed (especially when you are bribing them with food). 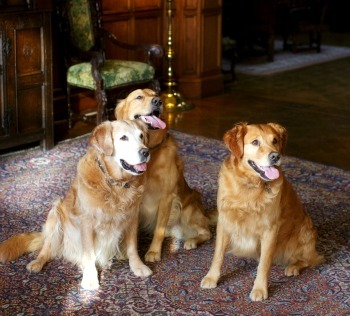 Awaiting their recurring role and third Dundas Christmas video appearance were Sir Jack’s Golden Retrievers, Burn, Beech and Bark and like the professionals they are they lined up perfectly and wagged their tails. After a fun morning spent with the various animals on the estate it was time to round up the humans of the Castle for their time to shine. 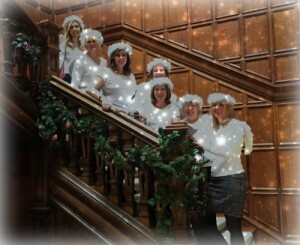 We had great fun filming our fabulous 7 Dundas Angels made up of some of the office team as well as the Dundas Private Staff, followed by the filming of our ‘TEN’ singing waiters – pause the video and look closely, you might notice they all look very similar…. Sir Jack and Lady Lydia also got their own scene and line as our ‘Two Friendly Faces’ welcoming guests to another perfect day at Dundas. The final feat was to record the Dundas version of The 12 Days of Christmas. 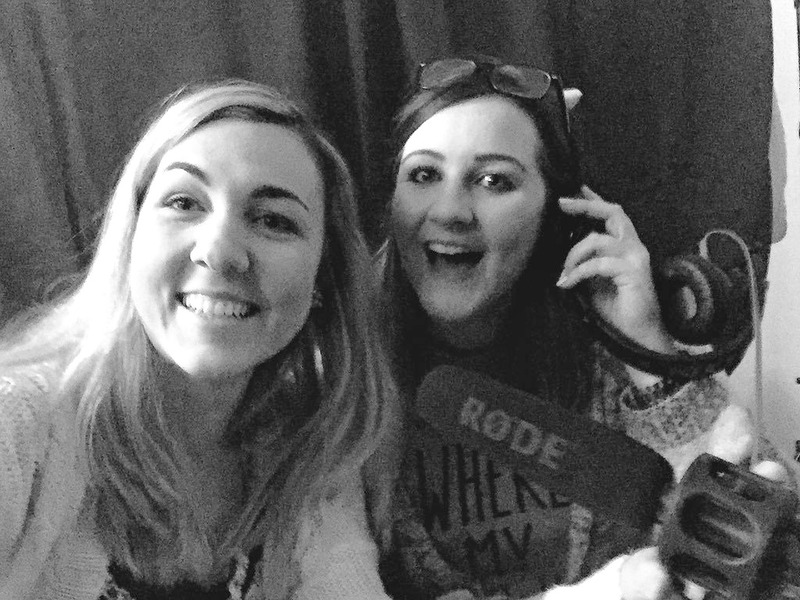 It was down to Kirsty our operations manager and Rachel to step up to the mic – we’ll let you judge our efforts! A big thank you to Dashika Rasaratnam who very kindly agreed to come in and play the piano for us, she really can put her hands to any music and was so patient as we recorded the song a few times to get it just right. And that was a wrap. We had such a fun day with Edinburgh Film Company and all the fab staff both from Dundas and Prestige. Watch the video again, here. 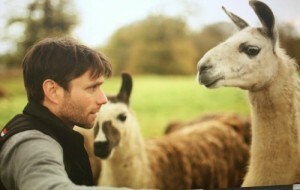 *no animals were harmed during the filming of this video, in fact they all had a rather lovely time.